So you've been bit by the ballooning bug, or perhaps you're just curious, in any case you may be wondering how a person becomes a balloon pilot. 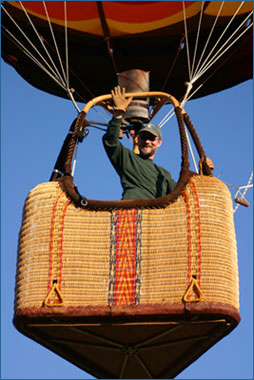 First you must understand that a hot-air balloon is an aircraft, and like other aircraft, flying a balloon requires a pilots license. Getting a license is much like getting a drivers license. You must go through a set amount of ground instruction, flight instruction, and then pass two tests. Sound hard? Don't worry it's not as bad as it sounds. Have a valid logbook endorsement from an instructor certifying you have completed your ground and and flight instruction. Pass the appropriate knowledge test. Meet the aeronautical experience requirements (have your flight training completed). Most individuals may look at that list and balk, but it is not nearly as hard as it may seem. Tests...and you thought you were rid of them then you reached adulthood! The FAA requires a pilot pass two exams; one written, and one as part of your flight review. The private pilot written knowledge test covers the basic knowledge expected: maps, weather, aircraft operations, radio operations, airport operations, regulations, etc... are all covered. Each test is tailored for your particular certificate area; meaning you won't get questions on how an airplane engines work, for the most part. Don't worry if it sounds daunting, a quick trip online to Aviation Supplies & Academes, Inc. (ASA), and you can order your very own private pilot test preparation book that covers all the questions. The second test is given as part of the flight review, or 'check ride' and is an oral exam before the flight. 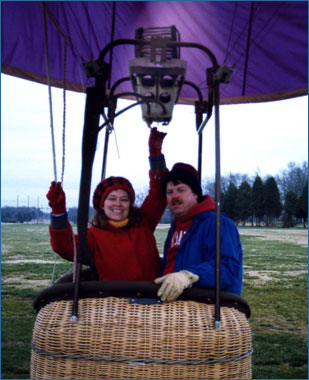 What examiner must cover is mandated by the FAA as part of the "Practical Test Standards", which is an outline of all the things you must demonstrate to show you can safely fly a hot-air balloon. Have 10 hours logged with an instructor in flight training in no less than 6 flights. Have one solo flight (all by your lonesome...and believe me, it is lonesome). Have one controlled ascent to at least 2000ft. Have two flights with an instructor, of at least one hour a piece, within 60days of your flight review (often called a 'check ride'). Now that's not so bad, at least it won't seem so bad once you've started; and it'll be fun! If you would like to learn how to fly a hot-air balloon than the next step is to contact a pilot who can instruct you or to attend an 'ground school', and we can help with getting you in touch, just Contact us.